BLEW BIRD #1144 FOR SALE - SOLD! General Description: “Blew Bird” is a 26 ft. Thunderbird (#1144) built by John Booth Enterprises in 1979 in Victoria BC. Includes Spartech racing mast and boom. It was purchased from the Boy Scouts in Wilmington, NC, where it had been donated by the original owner Tom Norris. Tom moved from the Seattle area and brought the boat with him to NC. It had been sitting in a marina for 2 years after being donated. It is one of only three T-Birds to be built with a “cruising cabin” configuration. It was delivered to MD in the Spring of 2004. This is one of the fastest Thunderbirds remaining in existence. No expense has been spared. Very competitive one-design or PHRF race boat. 2004 – Custom Triad trailer purchased new with electric brakes. Trailer has never been in the water. 2014: Sailrite 5.93 Oz Dacron class jib (6’-6” foot). Used once. 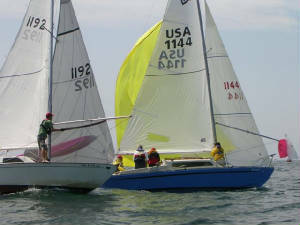 2011: Evolution loose-footed racing class Mainsail. Good condition. 2008: Rudder bearings replaced with custom machined bearings. 2005: T-Bird Internationals Boston, MA. Buy it on Friday, Race it on Saturday! Needs NOTHING to be a competitive boat in the fleet. Lovingly cared for and upgraded for the past 17 years. Stern hatches replaced with fiberglass hatches. Extra sails for cruising and daysailing. Sail it away for only $4000. 1964 plywood with epoxy skin Thunderbird. Completely race ready and class legal, and can be raced fully crewed or single handed. Pedigree includes - More flags than we can count! I bought a Thunderbird in September 2009 and had planned on re-fiberglassing the hull. In May, 2010 I discovered the keelson is rotten and the 1st 4-6 inches of plywood that meets up with the keelson is also rotten. Now it’s a bigger job than I can handle so I will part it out and invest in another boat.. Finally – all of the above except for the trailer - $2500. Please call Gord at 506-631-4023 or e-mail gwtmrtag@gmail.com for more info or to see if the item you are interested in is still for sale or not.